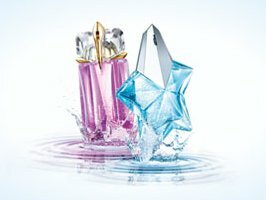 Thierry Mugler will launch Angel Aqua Chic and Alien Aqua Chic in March. The new flankers for Angel and Alien have "redefined the realm of dewy freshness" with formulas based on hydrosols or "plant waters". Angel Aqua Chic ~ developed by perfumer Aurélien Guichard; the notes include cornflower water, pink pepper, lemon, patchouli and vanilla. Alien Aqua Chic ~ developed by perfumer Dominique Ropion, with ginger water, verbena, freesia and woody amber. Thierry Mugler Angel Aqua Chic and Alien Aqua Chic are available in Eau de Toilette Light, in 50 ml for Angel and 60 ml for Alien. Aack. Attack of the Flankers. TM does tend to do better flankers than most, but admit I am not excited about these 2. Umm, what’s up with pink pepper being the new pink pepper? I’m getting tired of all these flankers… Yawn! ‘Womanity Eau pour Elles’ ??? Was the name “Womanity” not hint enough that it’s pour elles? And who says, I’d like Womanity, if only it were sweeter. Ohhhh, now that new womanity does sound interesting! ‘Interesting’ is the word. Not too sure how the caviar will translate? To me, the caviar in the original Womanity was a pervasive brininess–like the smell of the docks near a fishmonger. I would assume (hope?) that with strawberry, they would tone that note down. Aquatic Angel? Does not compute! I rather like the sound of these. I liked the Angel edt and Sunessences, although I don’t particularly care for Alien in any format. Just make a new parfum!! Angel original has a five star Rating. I am in love with TM’s fragrances, and Alien is my absolute favorite. I’ve made it my signature scent. I think he is a genius, every 15 minutes you smell a different note. They are complex and layered, like a musical composition. The cognac aged elixir flankers are really scrumptious. I always liked Angel a lot and even wore the Peony flanker. But “fresh” and “dewy” have never been attributes of this boozy chocolate fragrance. After so many limited summer edition, they should now. Still, will give them a sniff. Alien has a curious legend in my neck of the woods. Apparently, if you wear Alien, it somehow “alienates” your significant other. If you are single, you stay single. If you have a SO, you break up. I’ve never more than tried it in the shop. so this is not first hand but It happened to friends and aquaintances both straight and gay. Anyone else experienced this? Those do sound sort of weird, having a hard time imagining an acquatic Angel, however, I can imagine that the Womanity flanker could be interesting even though I am still not sure about Womanity itself. Yes, what’s up with all these flankers and all these horrible names? Since everone has been doing them I guess the trend will not stop.